Laser Shootout! 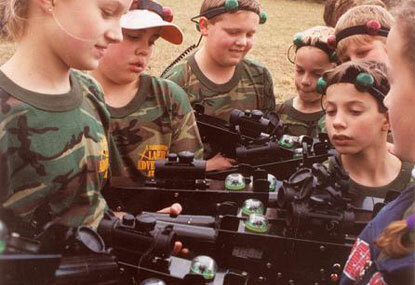 is an improved version of the old laser quest or lasertag (laser tag) systems that used to be played indoors. The effective range of these combat guns are much longer now, even outdoors, in broad daylight! The weapons used are custom made for combat simulation purposes. They use infra-red beams, the same technology that our television remote controllers use. It runs on a battery and shoots out harmless infre-red rays and makes some noises as it does so. It does not involve any projectile and is therefore safe to use in indoor or outdoor settings for our combat simulation games. änergy is proud to present this exciting sport to Singapore, to provide another quatlity teambuilding game for Singaporeans. Combat laser games can also be used to impart learning values like leadership, delegation, team building, and communication. It is an excellent choice for staff retreats, team bonding and family days. contact us to find out more. Drop us an email today!